CopyStorm/JobRunner is the command line tool used to run jobs defined by CopyStorm/Director. 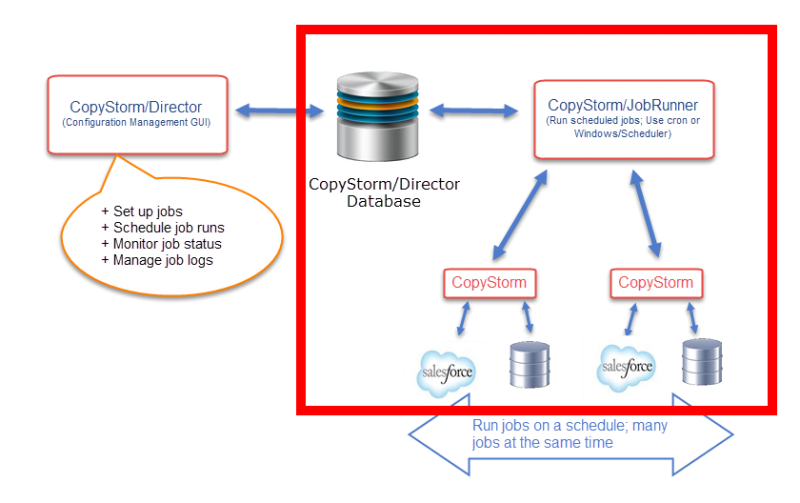 CopyStorm/JobRunner is typically scheduled as a job using a native scheduler (e.g. Windows Scheduler or CRON). In this mode it will read job scheduling data from the CopyStorm/Director database and run the appropriate jobs. CopyStorm/JobRunner can be used to force jobs to run outside of their normal schedule. Specify credentials for a CopyStorm/Director database. Run the application from a command line prompt or a scheduler. CopyStorm/JobRunner’s main purpose is to execute jobs defined in a CopyStorm/Director database — the first procedure that must be understood is how to pass database credentials to CopyStorm/JobRunner. Please read and understand the CopyStorm/JobRunner Credentials article before trying to run CopyStorm/JobRunner. Add CopyStorm/JobRunner to a System Scheduler. Force a CopyStorm Job to Run on Demand. Click here for the complete command-line reference for CopyStorm/JobRunner.